“He has done all things well. He makes the deaf hear and the mute speak.” In fact, He, Jesus, has done much more than that. He has also destroyed death and given to each of us the gift of eternal life. It seems to me that this week’s Gospel and Sunday readings contain a very powerful reminder about what our faith is all about and where it is as Christians that we are really called to place our faith. There is a beautiful prayer that is said when an infant is baptized. It is known as the Ephphatha Prayer. Based on today’s Gospel story, the prayer goes like this: “The Lord Jesus made the deaf hear and the mute speak. May He soon touch your ears to receive His word and your lips to proclaim His faith, to the praise and glory of God the Father.” As the celebrant of baptism says this prayer, he is to touch the infant’s ears and mouth. This prayer is said at the time that a child is baptized. In almost all cases, those children for whom the prayer is said have no impediment in hearing and speech; so why is it said? I like to explain it in this way: During the child’s life, he or she will hear millions of words. Many of these words will give them negative messages; telling them that they have no value unless they are rich or successful; and at times leading them to forget that they are children of God. The prayer asks that all those who are baptized will hear the Gospel and the Good News of Christ’s salvation and recognize it as the Word of God and that he or she will also speak God’s word and proclaim His saving actions so that other people will also come to believe in Christ and know His salvation. The reports that we are hearing in these days about the failings of the members of the Church are shameful and shocking. We must not dismiss them and we must all work to see that these actions are not tolerated. We must say an emphatic “no” to sin and abuse. However, these sins of other human beings must not deafen us to the Good News of the Gospel of Jesus Christ. When the sins of other human beings deafen us to the Gospel of Jesus Christ, the Devil is victorious. At the same time, when we as Christians hear about these sins and betrayals, they should not have the power to silence us. 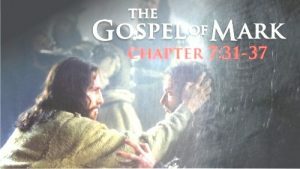 The Gospels face head on the weaknesses of Jesus’ followers when they report openly the betrayal of Jesus by both Judas and Peter. They could have tried to hide these embarrassing facts about those chosen by Jesus himself. Instead of being silent about these failures of Jesus’ followers, the Gospels use these human failings as reasons to proclaim the salvation to be found in Christ through His Church. Again, if our sins, or the sins of others, lead us to silence, then the Devil and despair are victorious. The only proper response for a Christian who is confronted with sin is to proclaim the Good News of the Savior who alone can free us from sin. When sin and evil are clearly evident, the only thing for a Christian to do is speak with greater conviction and certainty of the salvation and freedom to be found in Christ. Pastor- St. Peter’s Parish— Toronto.